You can’t go without the necessary furniture items in hand while intending to establish sophistication to a particular interior environment! The table furniture is the most important one that can be seen almost in every room of your home and also at outdoor! Tables are the furniture items that are to find in abundance in a home performing different tasks and here we are to throw some light on the side tables which are mostly to see standing around the living room reclining chairs, sofas and at the end of every sitting plan! They help to keep your personal items and refreshments like mobile phones, drinks and coffees in arm reaching while going through a comfortable sitting experience! So, if you are in search of some outstanding side or end tables that will complement your particular indoor or outdoor sitting furniture sets and plans then you can just go with the DIY projects! Market prices of side tables can be higher so you making some side tables at home can be taken into consideration to save a lot of your hard earned money! 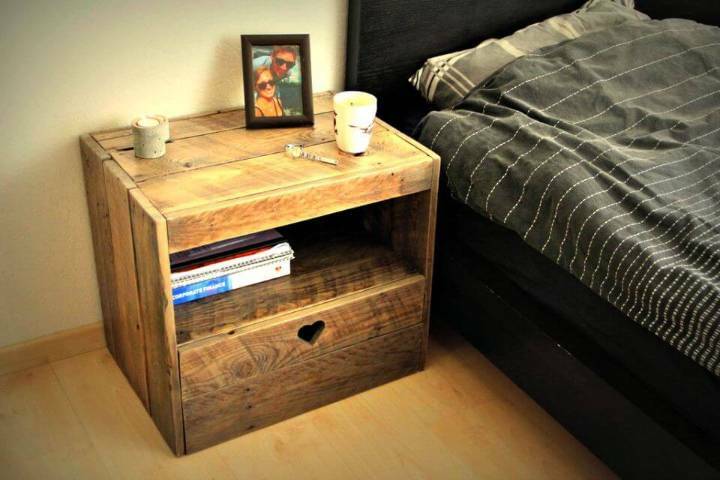 So, are you willing to make outstanding wooden side tables at home? And you want to do it by spending much less from your pocket? 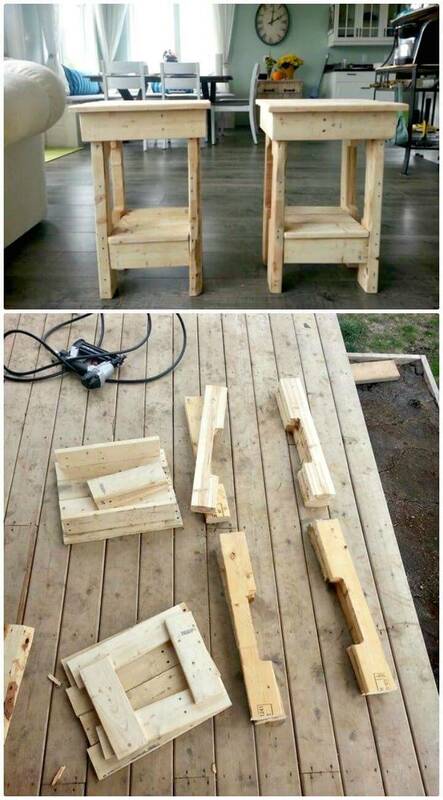 If yes, then you can simply head over to free pallet skids that can help building any favorite design of a side table at just no-cost! 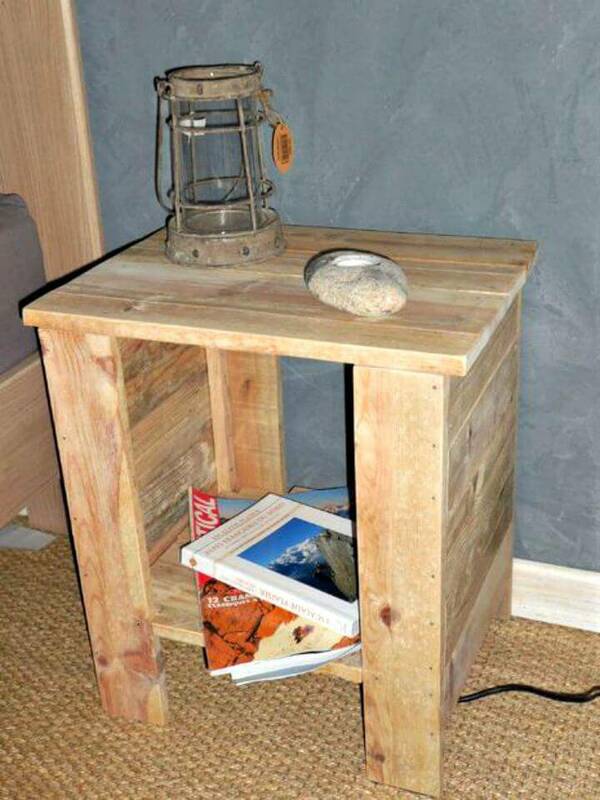 Just check out here the 7 DIY Pallet Side Table Ideas / End table with step by step instructions that will definitely win your heart with amazingly creative but easy-to-build design structure! 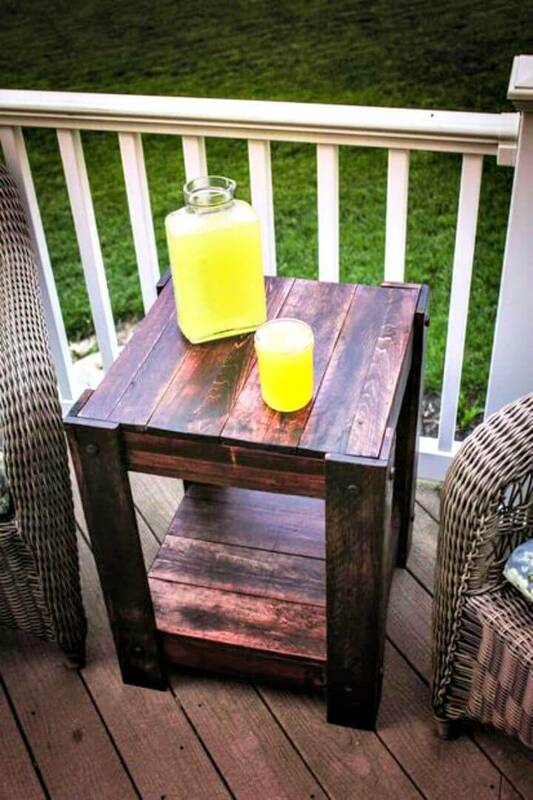 The list DIY pallet side table Ideas will provide you several handcrafted pallet side table design that will come with custom added features and you will also find great ideas about how you can personalize them to serve your purpose best! Here what is common in all these pallet side table projects is that they are all made of separated apart pallet slats which can easily be grabbed in piles after dismantling a few pallet skids! Just put together the plucked apart pallet slats to build different parts of a side table like from table top to building the base skeleton! 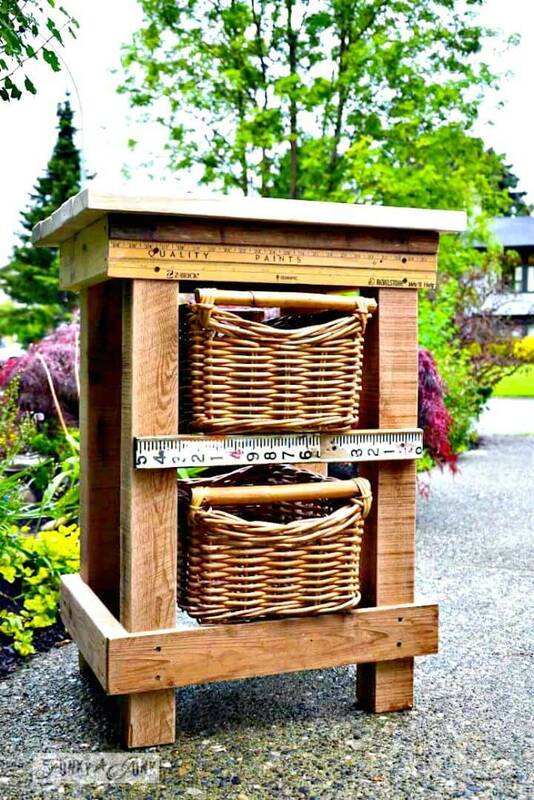 Build the storage-friendly side tables with pallets, check out here the sample side table design that is having two built-in shelves filled with baskets! 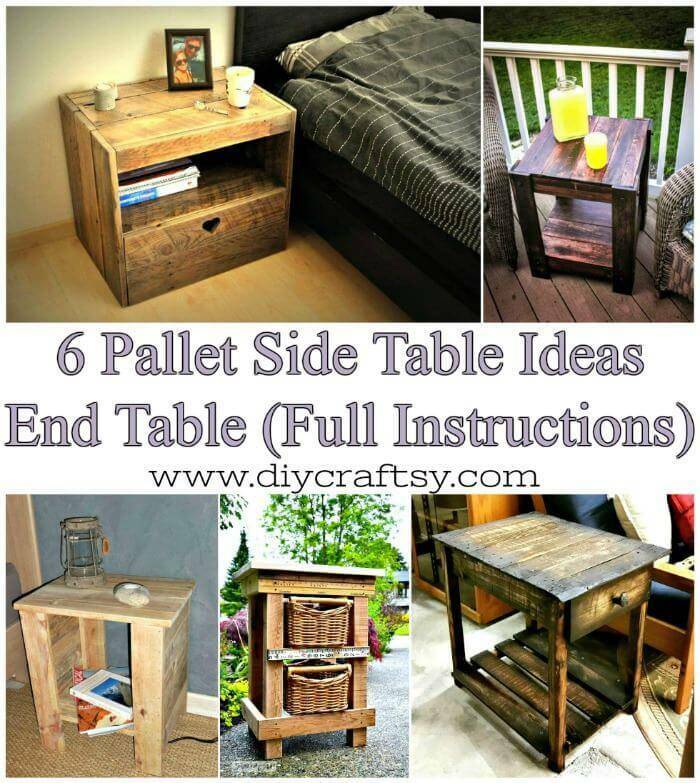 In the same way, you can plan the pallet wood slats with single or no bottom shelf and you can also precious end tables with drawers, get inspired of some lovely samples given below in the list! Moreover, all the pallet side table and end table designs would also serve as an outstanding nightstand in your bedroom if you like to do so! 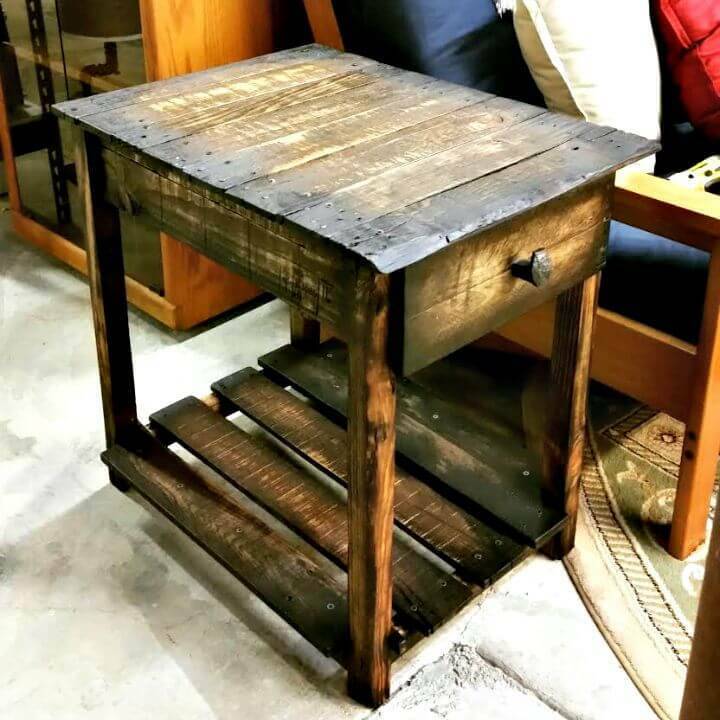 Give a custom finish to these wooden self-made pallet side tables or just keep the rustic look of them for vintage-inspired and rustic interiors! You can make use of paint, stain, and custom wooden sealants to create a custom appeal or a custom wood tone of the pallet side tables along with durable weather protection! Just click the attached source links for complete step-by-step tutorials!